Budapest-born, Lisbon-based textile artist Katalin Huszár, came up with the concept for her NOTJUSTUSELESS project after seeing hundreds of straws littering the streets of Lisbon’s Bairro alto (one of Europe’s best party places). The idea is to collect used straws from consumers at dedicated locations and institutions and let designers create new objects, installations and textures from them. The design then returns to the location, offering consumers a chance to see their waste transformed. The project aims to create an environmentally friendly mindset addressing a seemingly trivial, yet troubling phenomenon. The idea of such collaboration between designers, institutions and consumers, is to draw attention people’s attention to the troubling issues our current way of life creates. 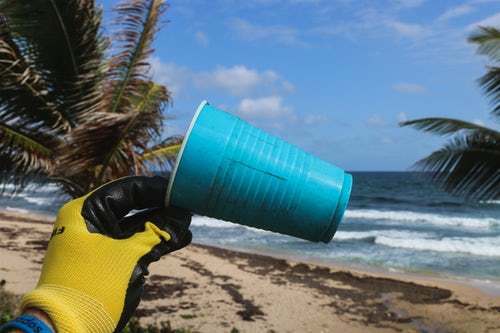 The straws can be both from a night bar that has chosen to decrease the impact of throwing away many kilos of straws, or from a project that works hard to clean the beaches from the straws that come to shore, after drifting in the ocean.